Ok everyone, so I am really excited because I found a couple of project pictures on my computer that I thought had been deleted so now I am able to share them with you, hooray!! 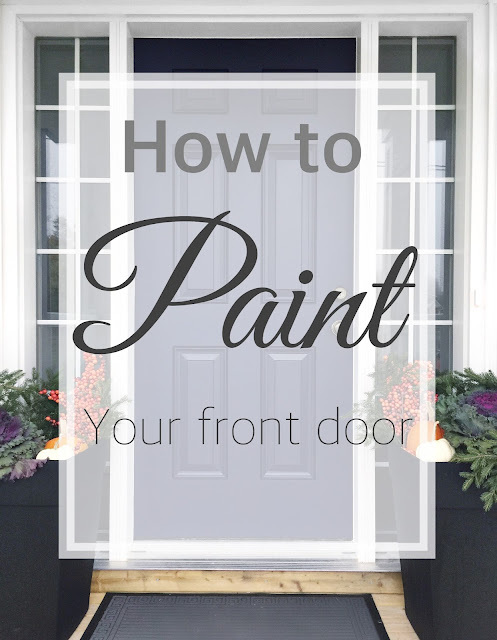 Today we are going to talk about painting front doors, and if you have followed my blog for awhile you know I talked about how I would eventually have a painted front door here. 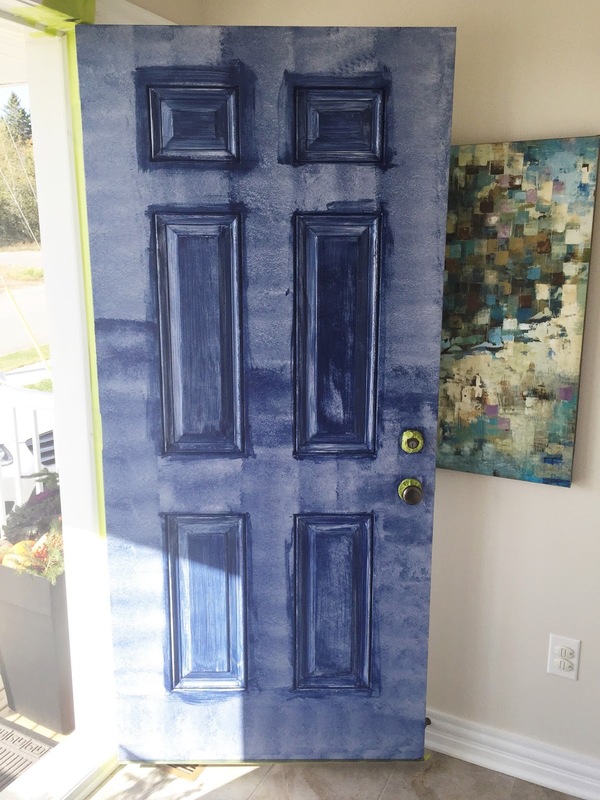 When we built our house I debated some different paint colours but ultimately knew I wanted to paint the front door a pretty navy. I did sooo much research on this guys I'm not even kidding because I really wanted a true navy. Something deep and saturated that wasn't going to look purple or cobalt in different lighting. When I found Sherwin Williams "Naval" I knew I had struck gold. 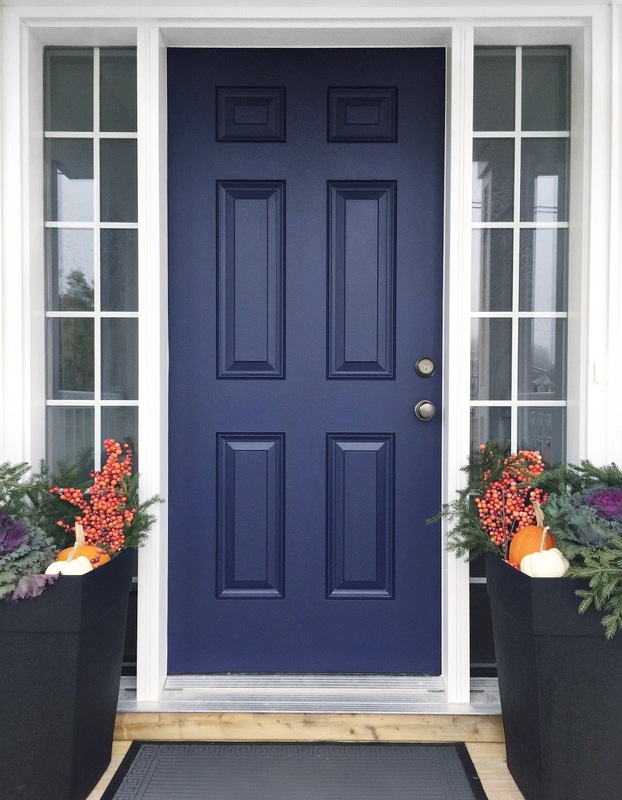 The funny thing is when I looked back on the previous front door post I did on the blog, it's actually the same navy colour that was used in one of the pictures I posted! So once we were settled into the house and a nice cool, sunny fall day came I decided it was time to paint! I picked up a court of the exterior enamel paint from Sherwin Williams and because our door was brand new it just had the factory primer on it so I was good to go (if you decide you want to paint your door and it already has paint on it, first determine if it's oil or water based and prime accordingly so your new door colour will last!) You also want to start this project in the morning because it's going to take multiple coats and you will need it to be dry by the end of the day so you can close your door and lock it. So first I gave the door a good clean and then taped around the lock and the weather seal and then got to work. I used a brush to cut in on the rectangles and a small foam roller for the rest. Well....after my first 2 coats the door was looking like this and to say I wasn't panicking would be an understatement. Of course my husband, who wasn't too found of painting the door in the first place (he loves it now though of course haha) was like "ah, babe are you sure it's supposed to look like that". So I just kept going and the door continued to look better and better with each coat, so don't panic if things aren't looking how you want right away. Overall, because the navy was so rich and the door was white to start, it took 4 coats to get a nice even layer that looked great. I am so thrilled with how it turned out and I am seriously obsessed with this colour, it's so beautiful and is such an inexpensive way to jazz up your home. I can't wait to start a little bit of landscaping this summer. I hope this post inspires you guys to give this project a whirl, there are so many great front door colours out there to choose from! Wow, you did a great job! Looks so nice and the colour is so deep! I like it very much. Recently, I have also experimented with my door. I repainted it, and changed the lock (of course this part was done not by myself, it is all the merit of my locksmiths http://georgia-locksmith.com/) on the beautiful vintage one. Looks very nice too! Awesome post. I like the way style you present this blog. Thanks for sharing and expecting more and more. The following tips can help you make this decision and provide you with tips for moving forward with window replacement Goodwindowworks house window repair Certified and licensed window repair contractors will ensure all your work is safely and superbly carried out. I'd like to know how everything is going with this about water heater repair services this topic. Should I discuss this out to my house constructor? Or I'll just to this my self? Awesome blog you have share here really this is very informative and creative ideas in this blog. If your door has old paint on it, it depends on the condition on the paint. If the finish is free of cracking and peeling, but simply needs a fresh coat the surface can be lightly sanded and cleaned and a fresh coat of Glidden Premium can be applied. If the surface is cracking or peeling, the paint needs to be removed with a paint stripper or heat gun. Always choose Locksmith Brixton to use chemical stripper. When using a paint stripper, it is important to be careful not to damage the metal with scratches or gouge. locksmith, locksmith Coventry, Coventry locksmiths, locksmith in Coventry, emergency locksmiths, locksmith service, local locksmith, auto locksmith. Excellent blog. I know How to make door color learned from here. Great site I enjoyed it very well. Installing a new door lock is essential immediately after a break in. This is the most obvious case in which you should definitely change your front door lock. Even if the lock has been picked and is still functional, not replacing it is risky.Always contact a trusty locksmith company to help you install new locks. Professional ,Locksmith west London have special tools and area able to extract old locks by minimally damaging your door. How much does it cost to hire our Orland Park kitchen cabinet painters? prices vary accordingly. Our professional Orland Park kitchen cabinet painters are skilled. Cost for Orland Park professional cabinet painters may vary, but if you find the right Orland Park kitchen cabinet refinishing companies, it is often worth it. Thank you so much for sharing this pretty post!